Cyfuture India Pvt. 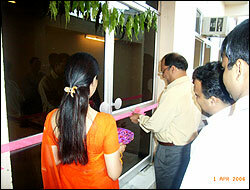 Ltd. (Go4Customer), a leading IT company, has expanded its operations by inaugurating a brand new delivery facility on Saturday 1st April 2006. Cyfuture, which comes with a background of nearly a decade in the Software industry, has invested over Rs.25 million in this new facility, with the purpose of providing dedicated services to some of its premier long term clients. 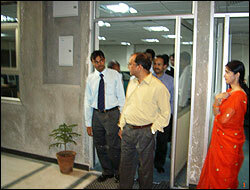 The facility has three floors dedicated to BPO operations with a capacity of seating 1000 people. Apart from well planned work stations and best of class computing & communications infrastructure, the facility also includes a training room for over a hundred people, state of art network room and a large spacious cafeteria. Mr. Anuj Bairathi, Director, Operations, Cyfuture said, "Go4Customer has been growing rapidly in the past few years- this new facility will help us expand our capacity to service our clients more effectively. We have invested over Rs. 25 million in the very best equipment and environment to enhance productivity of employees and ensure seamless delivery to clients. We have created a redundant reliable infrastructure to meet today's business needs and exceed service delivery requirements. This facility will particularly address the concerns of customers regarding Information and Data Security through a multi level security strategy. One of the major initiatives is its disaster recovery management system which would match international standards." Mr. Girish Gupta, CEO, Rajasthan Venture Capital Fund who was the chief guest at the inauguration said, "I feel extremely happy and encouraged to see new verticals emerging in the IT & BPO space in Jaipur. The only way to genuinely add value in outsourcing is to provide a specialist perspective and this is what Go4customer is doing for the BPO industry." Mr. Gupta also awarded the performers with mementos and certificates who contributed in their respective processes. Champion 2005 award went to Mr. Albert Peter and Network team was awarded the best team award. At the end lot of agents and Managers shared their experiences working with Go4Customer which were very encouraging for the new agents and trainees. An open house session was also held where the Senior Management set and answered the direct questions of all the staff members to their satisfaction.